Back in the 50’s and the 60’s, the two sisters Mary and Coralia appeared at precisely two o’clock every afternoon at the same spot where the display now stands. Dressed in brightly coloured attires and heavily make up, they spent the next hour or so flirting with the many students of the University of Santiago during their lunch break. Behind their laughter and seemingly mischievous behaviour was hidden the sad story that they were actually launching a silent protest against the very repressive reign governing Spain at that time after the Civil War. Seemed that they were both victims that lost their love ones during the Conflict. This seemingly simple piece reflected deeply of the suffering of the Spanish People during those very dark days of the War and the prolonged Dictatorship that followed. Please stop by Alameda Park in the Old City to admire and pay respects to Las Marias for their courage and defiance. The Business started out as a wine merchant/store in the 1870’s and by 1873 has evolved into a restaurant favoured by the locals. In the old days, chickens usually arrived in the restaurant from the farms and mostly kept in their cages until the time for them to be slaughtered and prepared for the Meal of the Day. There was one instance that a chicken was able to escape when the cage door was opened. The Chef or kitchen worker took after the chicken with a knife in hand. The chase ended up out on the street and a group of school children that just happened to be by, began shouting “Murderer, Killer” at the kitchen worker and thus the Restaurant was known as “The Murderer or Killer”. It became so popular that it was mentioned in magazine such as “Gourmet Traveller” as a Santiago original. 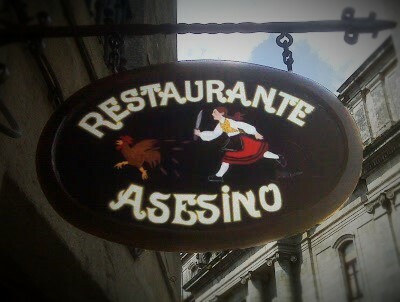 When in Santiago, stop by for a visit. It will be worth your while.